One of the biggest frauds of our time is the myth of “clean coal.” A new study by the Center for Health and the Global Environment at the Harvard Medical School shows that the hidden costs of mining, transporting, and burning coal amount to about $345 billion a year. If the industry had to pay the full cost of its product, the price of coal would triple. The report, published this month in the Annals of the New York Academy of Sciences, is based on the first detailed life cycle analysis study of coal, from mining through combustion. 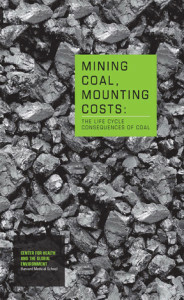 A summary has been published as a brochure, Mining Coal , Mounting Costs: The Life Cycle Consequences of Coal. “We estimate that the life cycle impacts of coal and the waste stream generated are costing the U.S. public a third to over one half a trillion dollars annually. Accounting for the damages conservatively doubles to triples the price of electricity from coal per kWh generated, making wind, solar, and other forms of non-fossil fuel power generation, along with investments in efficiency and electricity conservation methods, economically competitive. “Still these figures do not represent the full societal and environmental burden of coal. In quantifying the damages, we have omitted the impacts of toxic chemicals and heavy metals on ecological systems and diverse plants and animals; some ill-health endpoints (morbidity) aside from mortality related to air pollutants released through coal combustion that are still not captured; the direct risks and hazards posed by sludge, slurry, and CCW impoundments; the full contributions of nitrogen deposition to eutrophication of fresh and coastal sea water; the prolonged impacts of acid rain and acid mine drainage; many of the long-term impacts on the physical and mental health of those living in coal-field regions and nearby MTR sites; some of the health impacts and climate forcing due to increased tropospheric ozone formation; and the full assessment of impacts due to an increasingly unstable climate. Coal accounted for 25% of global energy consumption in 2005, but generated 41% of the CO2 emissions that year. In the United States, coal produces just over 50% of the electricity, but generates over 80% of the CO2 emissions from the utility sector. Coal burning produces one and a half times more CO2 emissions than does burning oil and twice that from burning natural gas (to produce an equal amount of energy). The energy penalty from CCS (25–40%) would increase the amount of coal mined, transported, processed, and combusted, and the waste generated. Today, 70% of rail traffic in the United States is dedicated to shipping coal. Land and transport would be further stressed with greater dependence on coal.